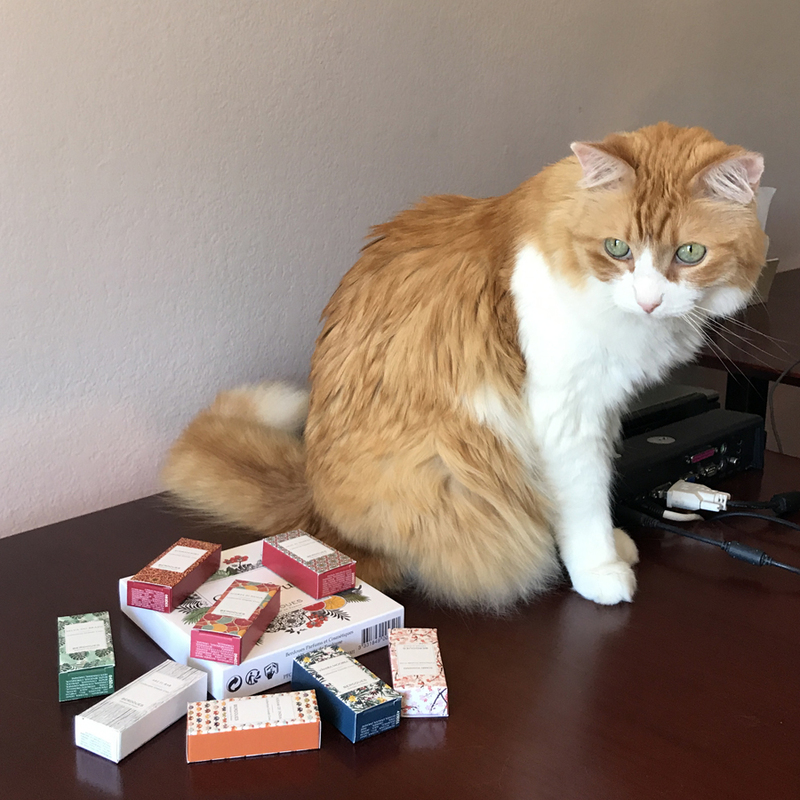 This entry was posted in "Four legs good", Attempt at a Review, Bête Noire, Favorite Perfumes and tagged Arz El-Rab, Assam of India, Berdoues, Oud Al Sahraa, Russkaya Kozha, Scorza di Sicilia, Selva Do Brazil, Somei Yoshino, Vanira Moorea. Bookmark the permalink. I didn’t care for Somei Yoshino either and I didn’t smell much iris in Arz-el Rab. I quite liked Assam of India and Scorza di Sicilia but I don’t need another citrus, my supply of classic Atelier Cologne mini bottles will last for decades. Assam of India was a blind buy for me and my first Berdoues full bottle…I bought it last April with a birthday gift certificate only because of the elephants on the bottle…and then I wore it for seven weeks straight in the summer so I guess I really liked it! I bought three other full bottles for gifts for family members based on their tastes in perfume…Arz el Rab, Vanira Moorea and Oud al Sahraa…because they are in my house and easily accessible I get to wear them all :) ….Arz is all about the cedarwood on my skin and Oud is very jammy and sweet…..I like the Vanira as well and only bought it because my daughter is a vanilla fiend…I think hajusuuri says it is a dupe for Precious Nectar and a much more affordable price. I agree that these are nice substitutes for Jo Malone and Atelier and this is probably why I like them as you know I am a big fan of both of those houses as well. Plus, the bottles are so pretty to me…I would love to have the entire collection on display in my house (one of these days!) and the price is amazing! ( I bought all of mine discounted online ranging from 59-70 dollars, which, for 100ml of niche , is practically free!) I would also love to see these in 30ml or even 15 as long as they keep the bottles looking the same. In general, Sephora is good at pressuring brands that they carry into doing smaller sizes, so we can hope. I should go to my local Sephora to see if they have this brand: I’m curious to see those elephants. Had not heard of this company before reading your post, Undina. Always good to be informed by your forthright reviews. And had a good chuckle about the since 1902 part. It seems too many niche fragrance companies are inventing a story and heritage. I had not heard of this company either, but was charmed by the lovely retro prints on the sample boxes. That style of packaging was also used to great effect lately by Le Jardin Retrouve, and really appeals to me in the same way as those paperbacks do that have been republished with vintage dust jackets. Of the range, only the last two caught my attention. Luckily I have no bad toothpaste memories(! ), plus Vanira Moorea sounds like a really bad corruption of my name. Well, no worse than Verruca Mushroom, which I have had. And then the leather one has benzoin…hmm. I might not like it, but am also a fan of cardamom, and anti-birch tar, plus your endorsement counts for a lot. So yes, curious about that one too. 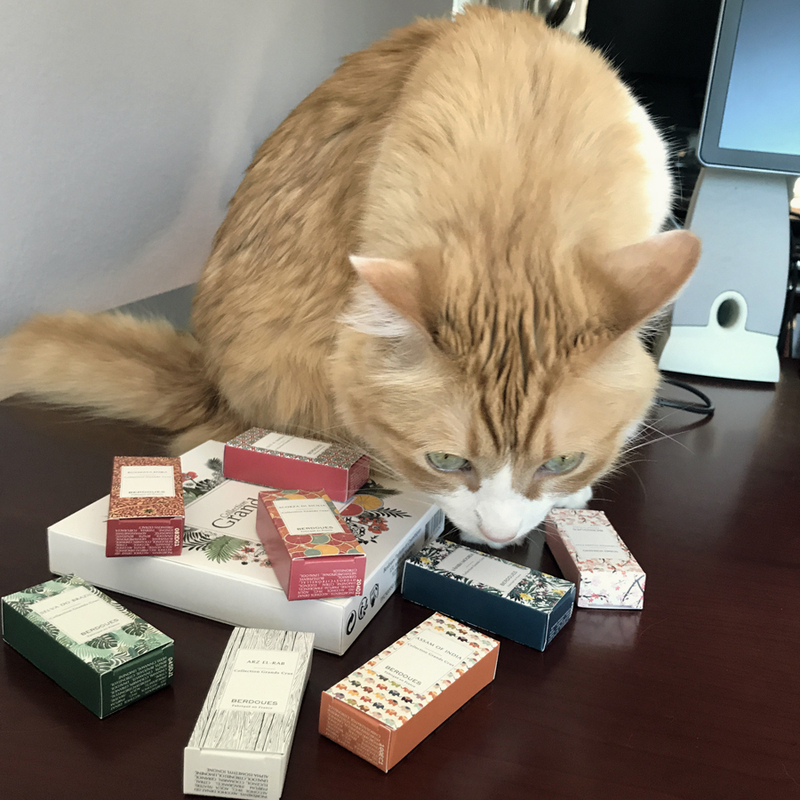 that sampler looks mighty tempting and easy enough to obtain at Sephora…looks like Rusty likes it too :)….the artwork on the boxes is beautiful. I’m a sucker for small sizes and nice packages :) And I’m extremely busy these days – otherwise I would have tried to smell these first at Sephora. But the set looks very attractive. It’d be perfect stocking stuffer. Yes, those “go-to” perfumes for everyday are necessary. It actually helps to go to a store with an “agenda” and try anything else only after finishing the “compulsory program” :) Otherwise we usually start with re-smelling things that we’ve already tried and liked – so by the time we get to anything new, we can barely smell it. Rusty was well rewarded for his participation. The debate on comments on APJ and Bonkers reminded me that I meant to comment here on Berdoues, then got distracted and forgot! So, my silly little comment is that I once bought Berdoue’s Violettes de Toulouse because someone on a blog said it was like Balenciaga’s Le Dix (I was searching for a replacement of my much loved old friend). Well, of course, it isn’t at all like Le Dix to my nose. 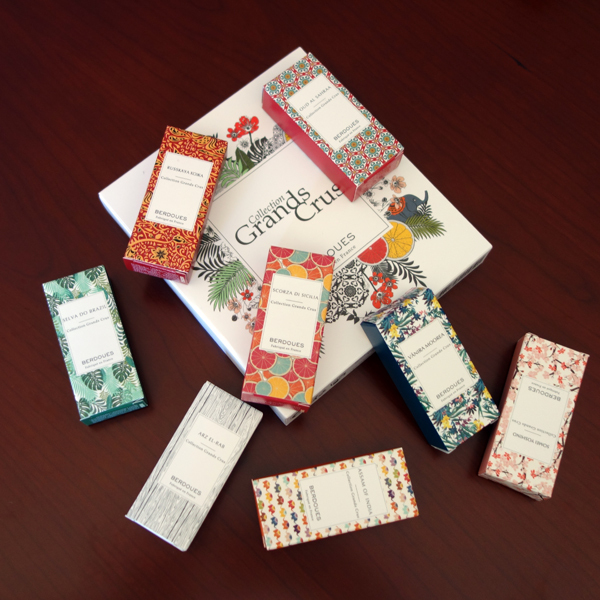 But I was given a generous sampler set with my purchase and I have never sniffed any of the perfumes in it. So I will be searching in the far reaches of my wardrobe for that now. If my memory (shaky at the best of times) serves me right, I thought that Violettes was far too sweet and gourmand – but perhaps I will find that too in my hunt and give it another try. I’m glad you found time to come over! While on a couple of occasions I spontaneously came across perfumes that had close resemblance to some other perfumes (I even have a series for those on the blog – Déjà vu), but I don’t remember ever agreeing with somebody else’s idea of any “dupes” – so I’m not surprised that your search for the lost perfume wasn’t successful. If you want to try the perfumes you have, you should either hurry and choose a sunny warm day for your testing – or wait until the next spring: I don’t think these are suitable for the cold season – maybe the vanilla one and Russkaya Kozha. It doesn’t mean that those cannot be worn in cold – many people enjoy their uplifting summer perfumes in winter to remind them of summer but I think that the first impression from the new perfume might be spoiled by the “wrong” season. You are so right! Some of my favourite perfumes really annoy me if I wear them in the wrong season. Which makes me realise that perhaps fragrances should be given a “second chance” (but not all!). I agree with Undina. These are really nice in warmer weather. Although I like the Arz in spring and have worn both the Oud and Assam in the winter (the cold amps up the sandalwood in the Assam on my skin). I actually enjoyed several from the line in summer. I am not a fan of big super oud notes, but I enjoyed the lighter oud in Oud al Sahraa. I agree smaller bottles would be good, and also agree that Jo Malone is pricing themselves out of my comfort zone, for the shortness of longevity on my skin. I will probably finish my Oud al Sahraa sample but unless they come up with a cute small bottle, that will be it. Jo Malone… I’ll keep trying their new perfumes but I expect less and less from the brand.